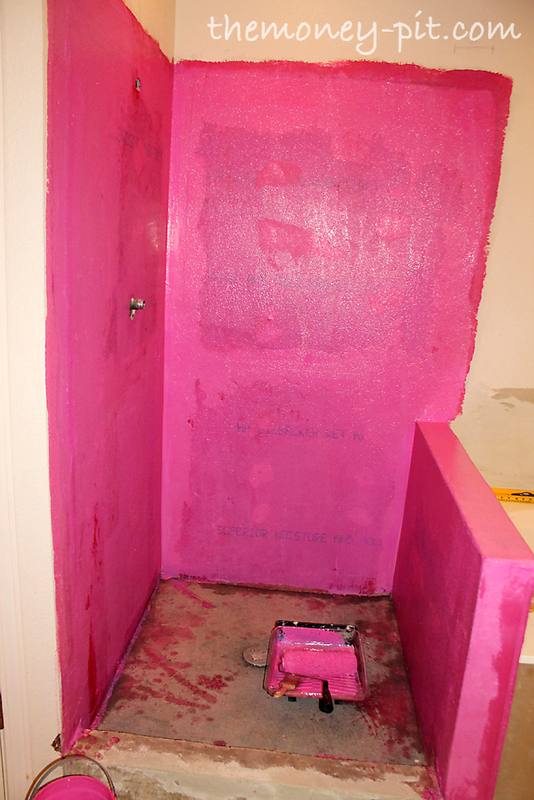 The last three days of the bathroom transformation have been full of lots of odds and ends. The first thing I had to finish up was pouring the shower curb. 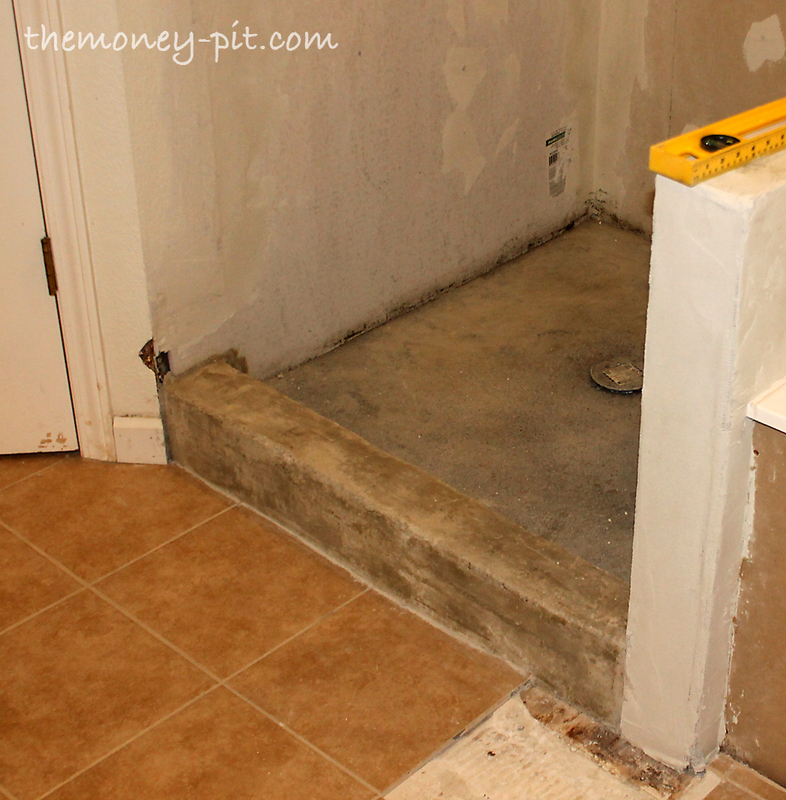 When building a shower curb you need to keep in mind that building code requires the top of the curb to be at least 2 inches higher than the floor of the shower. 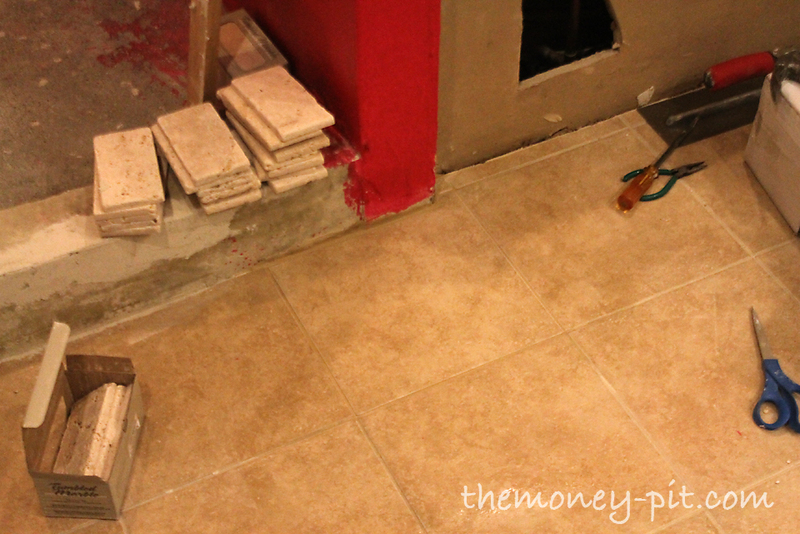 So that means the top of the curb after you put the mortar on it should be at least 2 inches higher than the floor you just poured (since the thickness of the tile on the floor and the curb will be about even). My curb is built out of 3 stacked 2x4s and because my floor is only about 1 1/2 inches thick (plus another inch in the pre slope) I had plenty of room. You then slather on mortar mix (premixed from the bag like I used on the preslope, not the deck mud you used on the shower floor) and form the curb. 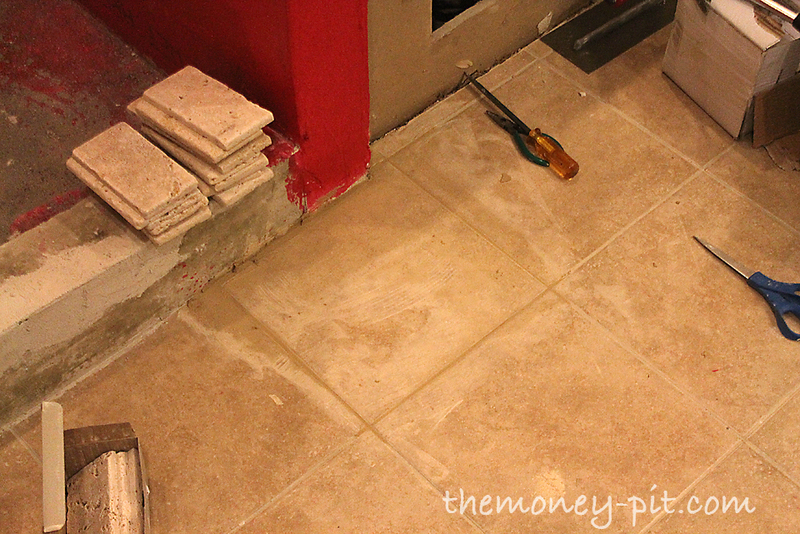 Mine only came out so-so, so I had to go back and re-square the corners with a second coat of mortar. Remember you want the curb to slope slightly towards the shower floor so that any water that hits it will run towards the drain. After seeing those photos, you are probably wondering why the wall is red. Well, that is the other big part of the work I got done these past three days. WATERPROOFING! 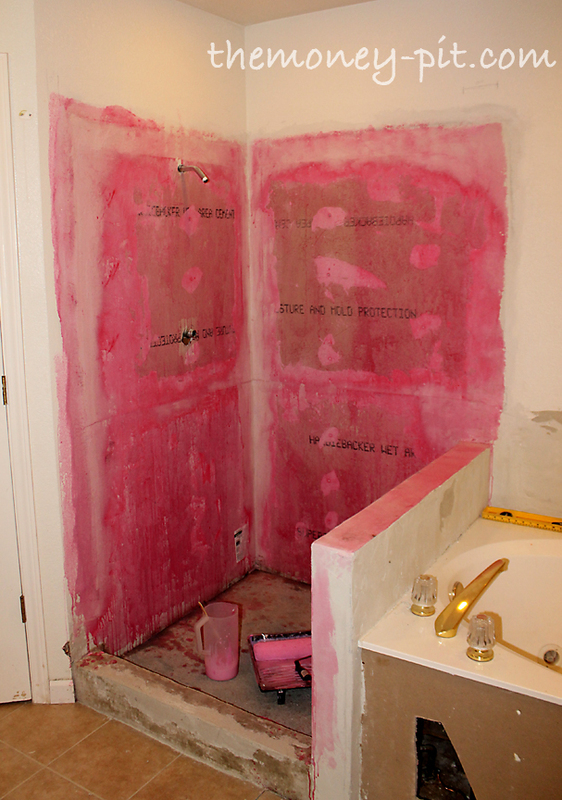 The red "paint" on the walls is actually a roll on waterproofing membrane called RedGuard. 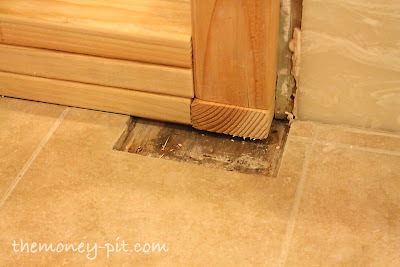 Because I am working with a knee wall I could not use waterproofing behind the cement board. 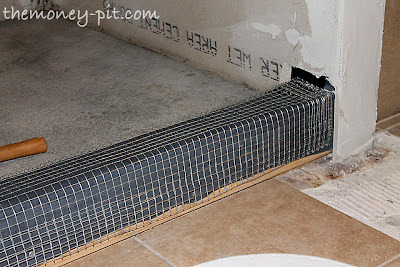 If I were doing a typical stall shower I would have just nailed up either plastic sheeting or roofing felt behind the cement board, but in front of the PVC pan liner so that any water getting through the cement board would be directed down the wall and to the drain. But in my case, since water could hit the top of the knee wall and get behind the cement board and waterproofing layer I had to put my waterproofing on TOP of the cement board. Enter Redguard. When applied to he walls, it makes a protective, waterproof barrier. Any water getting through the tile will hit the RedGuard, run down the wall and be caught by my drain pan. Once the walls are painted with the stuff you just have to be careful to not drill anything into it which would compromise the waterproofing. You can see the drips all over the place. It looks like a crime scene. Fortunately using undiluted RedGuard is a little easier. It is SUPER thick (the consistency of pudding) and has terrible fumes, but using a high nap roller, it does go on pretty smoothly. 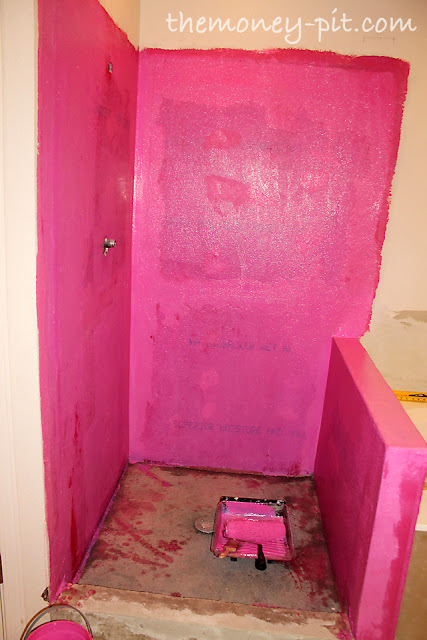 It is pepto bismol pink when it is wet and dries dark red. Typically it takes 1 coat of primer and 2 coats of membrane to achieve the proper thickness. The one drawback of RedGuard is the price. I bought 1 gallon for nearly $50. I was able to coat the entire shower stall and knee wall, and will eventually also coat the greenboard around the roman tub and I should just barely have enough. The last thing I did was to patch the hole in the greenboard where the soap dish used to be. I used a scrap of hardibacker and taped the seams. Then I used more mortar for the patch. 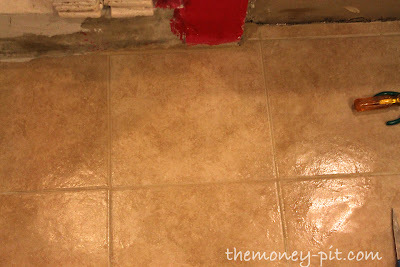 I just need to finish putting RedGuard around the tub and I can move on to tile! You got a little sneak peak of the tile in some of those floor repair photos above. You can see I have my work cut out for me! :) It does look like blood! So many steps! but in the end all worth it! It looks like now begins the fun part, well maybe after the tile! You just crack me up lady!! I love so much when I get your posts in my emails!! I am so impressed with your hard work and determination! You are doing a fantastic job with you bathroom and I am learning so much from you. I have a question...I think this was in a previous post...when you screwed the board around the shower, you said that you don't screw it in all the way down. Why is that? 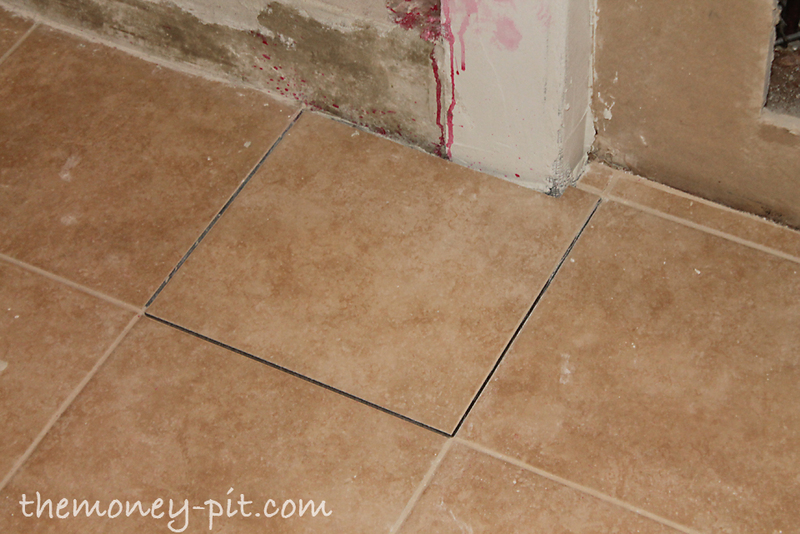 Won't there be too much flex in it when you put your tiles on and make them crack? Maybe I am missing something? 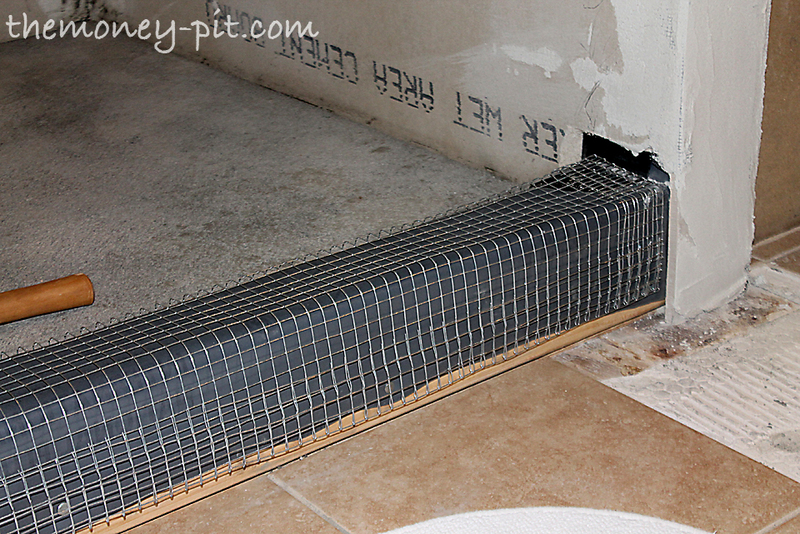 You can't put screws in the bottom 6-10 inches of the cement board since you will puncture the PVC liner you installed under the cement board.. water running down the Cement board will be caught by the PVC liner and so you don't want holes in it. 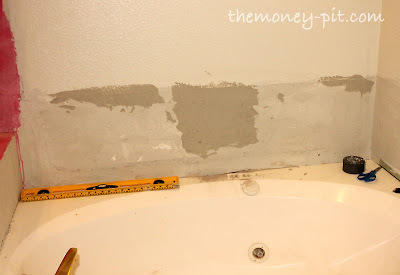 To secure it from flexing, you are going to pour your final layer of concrete over it (embedding the bottom of the cement board in the cement of the shower pan) which will keep it in place. I am so impressed with your skills and I am really enjoying this series. It is wonderful to see a woman working on her own home. You are serving as a great role model for women.